Small Cap. Growth and Value Opportunity Conference, comes to Boston, the birth Place of the Mutual Fund, and the center of the universe, for institutional investors home to nearly three trillion $ in assets under management. 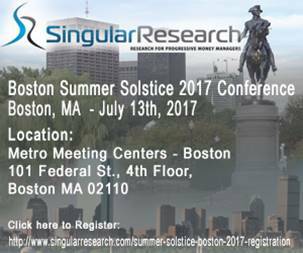 Singular Research will be hosting its 2017 Summer Solstice Conference July 13 in Boston at the Metro Meeting Centers, 101 Federal Street, 4th Floor, Boston, MA 02110. Featuring undervalued and under covered small-cap stocks. "Our conferences are not your typical dog and pony show or investment banking round up. We focus on best ideas that are performance-based that are under covered and misunderstood by the street," said Robert Maltbie, president of Singular Research. "Our coverage list has provided an unmatched performance, beating the competition and the market indexes by wide and consistent margin over the last 12 years." Presenting companies and times will be: 9:00 a.m. to 5:00p.m. 11:15 am Exco Technologies Limited (XTC.TO) Darren Kirk Executive V.P. 5:00 pm LeMaitre Vascular, Inc. (LMAT) Steven Chehames, V.P. Investor Relations. Singular Research, based in Los Angeles this is one of the most trusted providers of unbiased performance based research on Small and Micro cap companies. Singular provides initiation reports and quarterly updates for approximately 40 companies in many cases Singular's analysts are covering companies that are not covered by any other firm.